THE MOST COMEDY YOU WILL EVER COMEDY IN YOUR LIFE. Aparna Nancherla (Late Night with Seth Meyers), Daniel Dae Kim, Helen Hong, Becky Yamamoto, Eugene Cordero (Kong: Skull Island), DeeDee Magno Hall (Cartoon Network's Steven Universe), and Shannon Lee (Bruce Lee Foundation). Hosted by Kat Evasco. Christine Medrano and Kiran Deol. 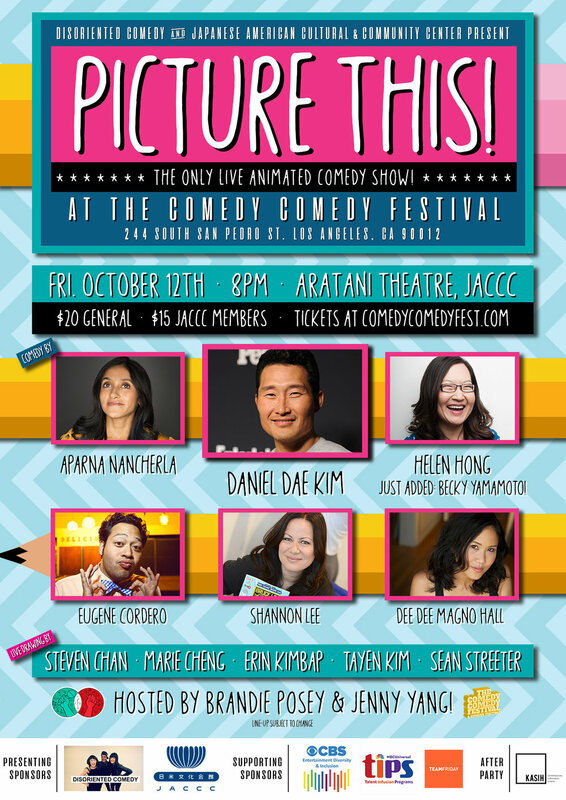 Featuring newbie standup comedy by Amanda Suk (Marvel’s The Runaways), and Sono Patel (Writer, CW’s Crazy Ex-Girlfriend). Improv by The Comedy Comedy Festival Staff and Room to Improv. Hosted by Ceda Xiong. Jared Goldstein and Yola Lu. Featureing newbie standup comedy by Minji Chang (Buzzfeed, First of All, Kollabcast), and Hollis Wong-Wear. Improv by K3wlAzN420 and South Asian AF. Hosted by Zahra Noorbakhsh. Andrew Lopez. Jes Tom. Ellen Wong (Netflix’s Glow). 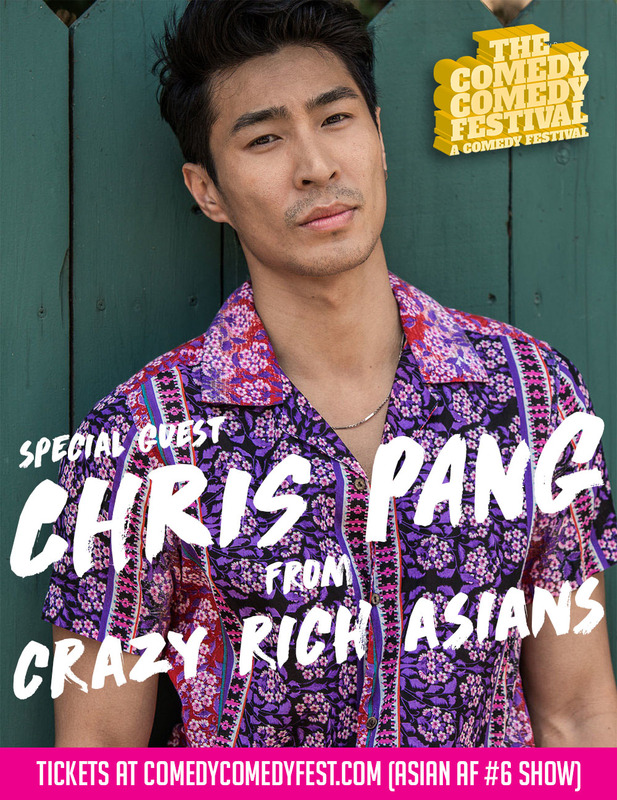 Featuring newbie standup comedy by Andrew Ti (Yo! Is This Racist). Improv by Out of Towners Improv (Dan Lee, Virgil Shelby, G-Su Paek - Austin) and Stir Friday Night. Hosted by Kasu Kusano. Chris Pang. Fizaa Dosani and Sierra Katow. 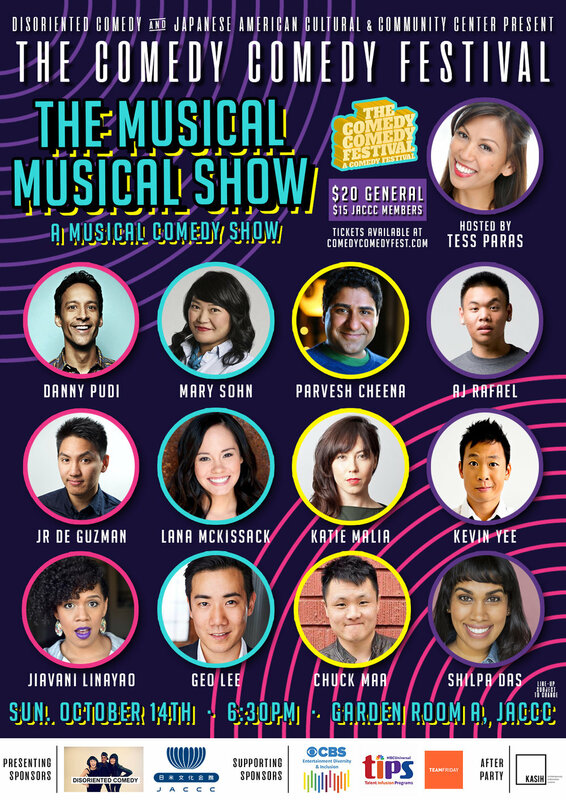 Featuring newbie standup comedy by Phil Wang (Wong Fu Productions), Lilan Bowden (Disney’s Andie Mack), Megan Lee (Singer-Songwriter). Improv by Cold Tofu and Miss Golightly. Hosted by Bri Pruett. Francesca Fiorentini, Ahmed Bharoocha, and Teresa Lee. 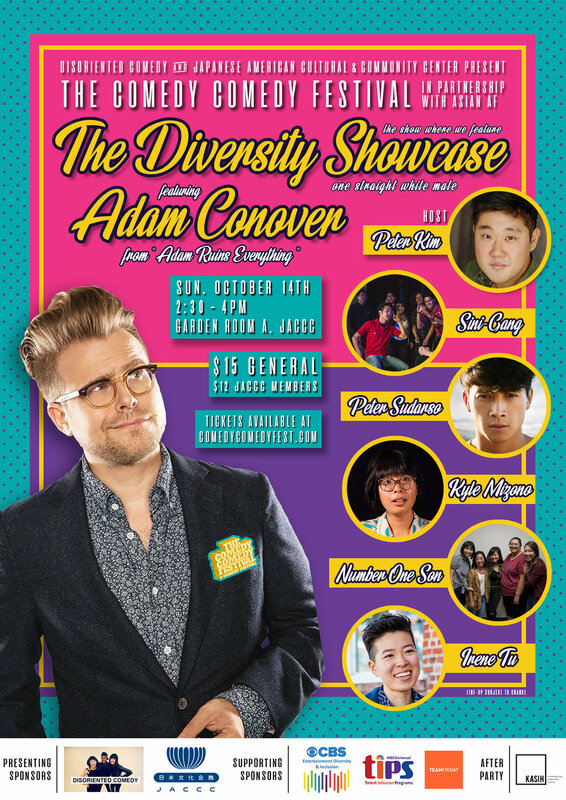 Featuring newbie standup comedy by Jake Choi (ABC’s Single Parents). Improv by Voltron with a very special guest TBA. JACCC programs are made possible in part by grants from The Toshizo Watanabe Foundation, The Andrew W. Mellon Foundation, Surdna Foundation, George, Ruri, Lisa & Nathan Sugimoto, Ken & JoAnn Hamamura, Aratani Foundation, The Ahmanson Foundation, Henry Ota in memory of Sue and Harry Ota, Suntory Holdings Ltd., Akira Uehara, Kawaguchi-Kihara Memorial Foundation, Folick Family, Los Angeles Board of Supervisors through the LA County Arts Commission. Significant in-kind support for JACCC is provided by American Honda Motor Co., Inc., Hoshizaki, Ushio America, Inc., American Airlines, and Bose Professional.